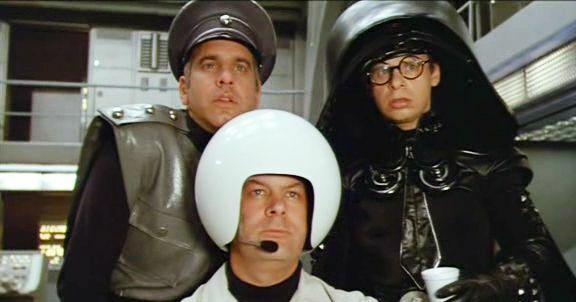 Spaceballs is an awesome parody of the Star Wars trilogy with just a few Star Trek jokes thrown in for good measure. Written and directed by Mel Brooks and staring Bill Pullman as the protagonist Lone Starr, John Candy as his side kick Barf, Rick Moranis as the antagonist Dark Helmet, and Daphne Zuniga as Princess Vespa. President Skroob is played by none other than Brooks himself who doubles up as Master Yogurt (a parody of Yoda). The premises of the film is that planet Spaceballs (basically the Death Star) is running out of oxygen and they devise a plan to steal all the air from planet Druidia, home of Princess Vespa and King Roland. When Princess Vespa runs away from her marriage ceremony she is kidnapped by Spaceballs One (Spaceballs' flag ship). Desperate King Roland hires Lone Starr and Barf to rescue the princess which means he must face his nemesis Dark Helmet. This film is full of good laughs for any science fiction fan.